In the post World War II period there were two types of people who rode a motorbike in America, outlaws and the police. But all that would change in 1963 when armed with his small Super Cub model, Soichiro Honda launched his campaign to win over the masses. The 12 year blitz that included sponsoring the Academy Awards convinced the US and the World that motorcycles offered a lifestyle they could aspire to. 50 years on and the success of the marketing campaign is obvious. The Super Cub has surpassed 60 million units and made Honda the world’s largest motorcycle manufacturer. 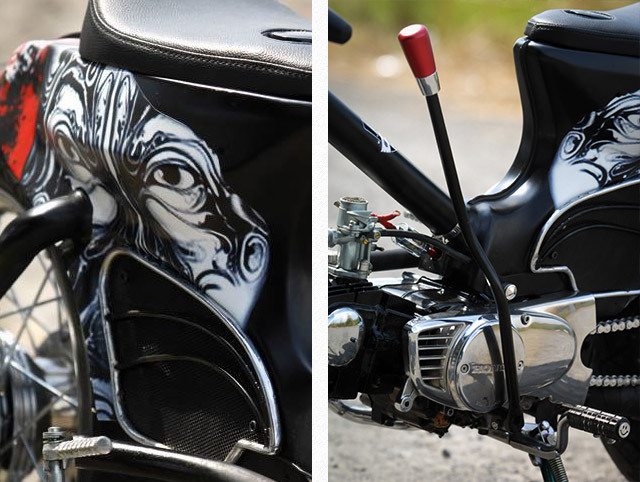 But never could Mr Honda have envisaged his little Super Cub being converted into an outlaw in such a way as Minority Custom’s “The Eyes”. Gone is the chain guard designed to keep oil off your freshly pressed suit, the upright handle bars and big comfy seat that took you to the office in luxury and just like it’s bigger rivals of the 60’s this little Cub is chopped down and bare boned. 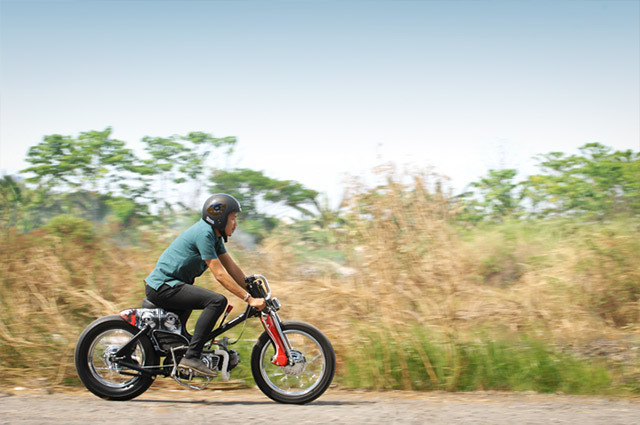 Starting with a 1980 Honda C70, Jonathan Evan from Minority Custom Surabaya, Indonesia set about creating a Cub with a “fierce and strong” road presence. Starting at the back of the bike a new hard tail rear section was fabricated and widened to allow the addition of a huge (by Cub standards) 130 rear tyre, giving the bike that classic Bobber look. The bench style seat was ditched in favour of a slimmed down bicycle unit and the fender deleted to remove more unnecessary weight. Complementing the rigid rear is a polished Springer front end with cut and reversed Honda Monkey bars for that ultra-minimalist look. The Step Through (or underbone) frame was smoothed and de-tabbed before being repainted and “The Eyes” graphics applied. 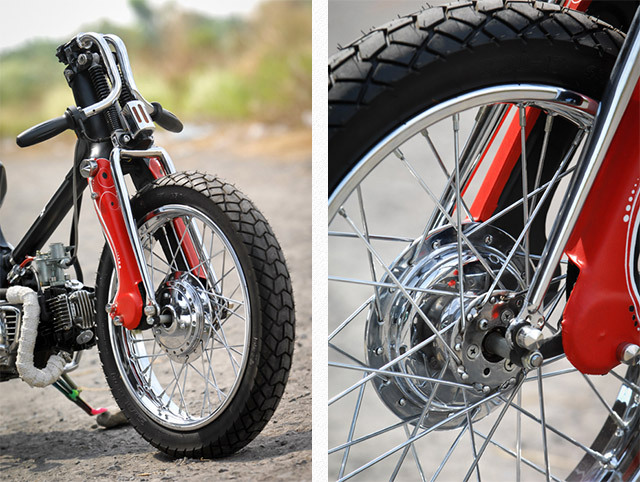 To keep the period look the standard rims were ditched and re-laced using polished Yamaha DT Hubs, resulting in a 17″ front and 15″ rear. 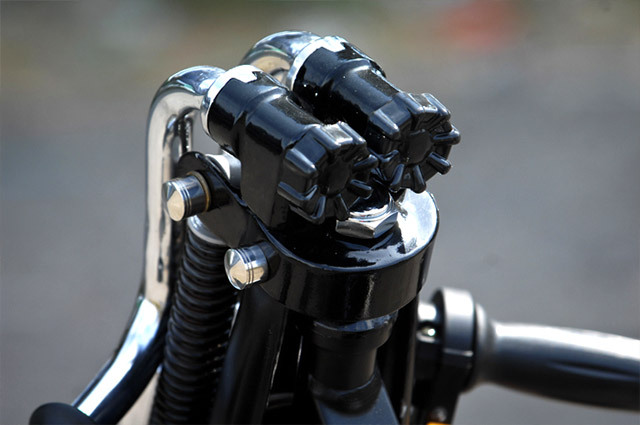 And nothing says Bobber like a suicide shifter. To give the Cub a little more pep, a larger custom carburetor was fitted and the exhaust is now a heat wrapped, straight through item ensuring “The Eyes” is both seen and heard. 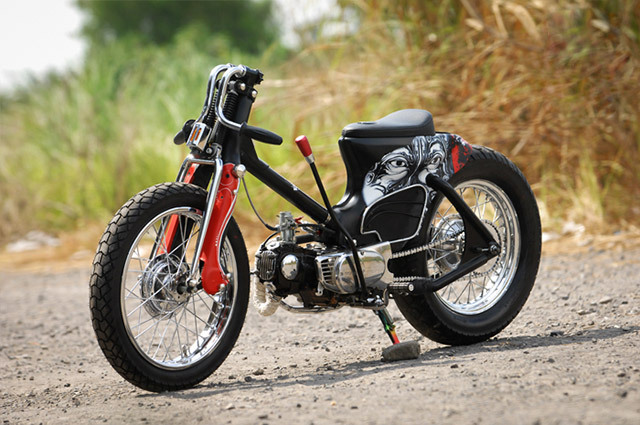 It’s hard to know what Honda-San would make of this marrying of his little Cub with its outlaw rivals, prowling as it does down Indonesian roads. 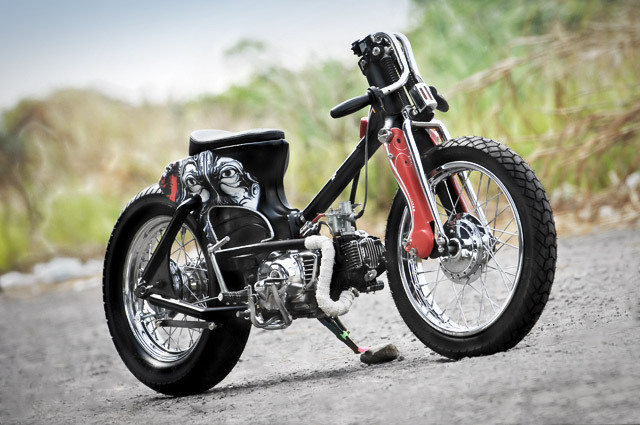 But in 2014’s custom culture this little C70 is Bad to the underbone.